After a lot of thinking, I have decided to sell my 1953 Sunbeam S8. She was a "shed find” in Moncton in 2003 and I had to do a complete restoration/rebuild, finished in 2004. About 1000 miles put on since. Never ridden in wet. Always stored dry. Currently in dining room! Everything was done in the restoration. Contact me for details. Mostly original bike but mudguards and tool box are fibreglass (good tinware almost impossible to find). Distributor ignition modified to double-banger coil but have all parts to revert. Comes with lots of spares and books, maintenance info etc. All parts available through: https://www.stewartengineering.co.uk/index.asp. Some parts standard (front forks and from brake similar to BSA). I have full and clear ownership. This is a very rare bike in Canada, indeed anywhere, and is ready to ride. I am asking $7500, and this is a loss compared to what I have into the bike, but most of you would know the story if you have ever done a restoration! 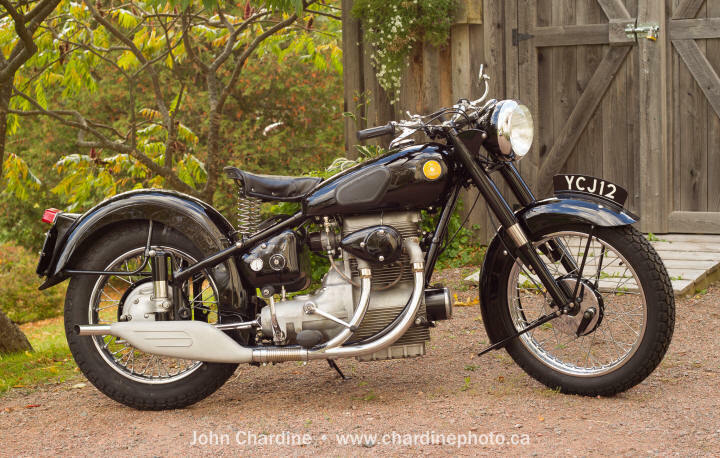 Motorcycle is located in southeast New Brunswick, Canada. Pickup from this location at your cost.